One of the most amazing things about cannabis medicine is its versatility. Patients with dozens of conditions have reported positive results regarding a range of symptoms after using medical marijuana. How is this possible? Because cultivators have learned how to grow specific types of cannabis called strains, all of which target a different set of symptoms. Indica: Indica strains are notorious for creating the “couch-locked” feeling. They make the user feel more tired than energized, making them more suitable for nighttime use. Sativa: Sativa strains give users more of the head-high associated with cannabis use. They are also more uplifting and energizing, making them perfect for daytime use. Hybrid: Hybrids can come in any ratio of sativa and indica strains, allowing cultivators to customize them to have a broad range of effects. The best hybrid strains are flawlessly grown to treat specific symptoms and conditions. You may be wondering how one plant can result in two different strains. It has to do with the chemical breakdown of the marijuana plant. Marijuana is made up of hundreds of elements called cannabinoids, each of which has its own effect. Tetrahydrocannabinol (THC): THC is the element of marijuana that makes the user feel “high” and creates the euphoric feeling often associated with smoking weed. THC is the most prevalent component in sativa strains, which is why they are more uplifting and energizing than indica strains. Cannabidiol (CBD): CBD is the cannabinoid most present in indica strains. It does not make the user feel high like THC does, but it still has many pain-relieving, calming and other medicinal qualities. This is why indica strains typically relax the user. These cannabinoids interact directly with the receptors in your body’s endocannabinoid system (ECS) to affect things like your mood, appetite, pain tolerance and more. By adjusting the amount of THC and CBD in your marijuana, you can essentially customize your marijuana treatment to suit you and your symptoms perfectly. How Does Marijuana Treat Nausea? Since every strain has a different CBD: THC ratio, it’s possible to treat a range of symptoms with medical marijuana. Just like some strains are best for headaches, there are also strains for vomiting and nausea. In fact, nausea is one of the few symptoms that indica, sativa and hybrid strains can all treat. Several studies have shown marijuana is an effective treatment for nausea and vomiting. One 1975 study found all 20 of the participants found relief from nausea after using THC products. Durban Poison: This pure sativa strain is well-known for packing a punch and attacking several painful or uncomfortable symptoms at once. You can recognize it by its sweet smell and energizing effects. It’s perfect for staying productive or exploring and treating your nausea all at once. Sour Diesel: This sativa strain is one of the most popular out there. With THC concentration between 21 and 22 percent, you can use Sour Diesel for your nausea, as well as migraines and depression. OG Kush: OG Kush is a sativa strain known for its uplifting effect that combats migraines, depression and nausea. 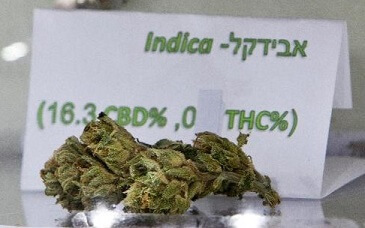 Many believe this strain is the best for people battling terminal illnesses as well. Headband: As a combination of OG Kush and Sour Diesel, Headband is the perfect hybrid strain for combating your nausea. It’s also ideal for reducing pain, relieving stress and promoting relaxation. Lemon Haze: Characterized by the smell of freshly peeled lemons, Lemon Haze is the perfect sativa strain for settling your stomach. With its green-yellow tint, fresh taste and high THC content, you’ll be full of energy and happiness when you use this strain. Chocolope: Another sativa strain you can use for treating your nausea is Chocolope. With its earthy, coffee flavors and euphoric effect, you’ll want to use Chocolope every morning to treat your nausea. Blue Dream: As a 50/50 hybrid of sativa and indica, Blue Dream has a way of adapting to whatever situation the user is in. Use this strain to relieve your nausea night or day, along with your stress and anxiety. Lavender: This indica strain has been known to treat chronic pain, inflammation and nausea without making the user feel high. However, it also causes some drowsiness, so it’s best to use this strain at night before bed. Blueberry: Blueberry is one of the most relaxing strains of marijuana there is. After decades of perfecting the cultivation process, the Blueberry marijuana we know today can relieve pain, stress, nausea and more. Purple Urkle: With the smell of grapes, berry and a bit of skunk, Purple Urkle is easy to recognize. It’s known to create a deep sense of relaxation while relieving pain throughout the entire body as well as nausea. This sleep-inducer is perfect for those struggling to get a good night’s sleep. Remember, there are numerous strains out there. If your dispensary doesn’t have the exact one you’re interested in, ask the budtenders for a strain that’s close to it. It will likely have similar, if not identical, effects. Interested in learning more about treating your stomach issues with medical marijuana? Check out our in-depth guide to using cannabis for relief from nausea and vomiting. If you live in a legal state and don’t have your medical marijuana card yet, search our database to schedule an appointment with a reliable marijuana doctor and find a dispensary near you.